Jeremy & Melissa are to be married on April 10, 2010 at the Mission Inn and Spa, in Riverside, CA. Prince Weddings located in Huntington Beach, CA will be capturing the wedding photo's and video at this vintage riverside location. The above pictures where taken at the Union Station in Los Angeles. In 1926, a measure was placed on the ballot giving Los Angeles voters the choice between the construction of a vast network of elevated railways or the construction of a much smaller Union Station to consolidate different railroad terminals. The election would take on racial connotations and become a defining moment in the development of Los Angeles. The station took over service from La Grande Station and Central Station and originally served the Atchison, Topeka and Santa Fe Railway, Southern Pacific Railroad, and Union Pacific Railroad, as well as the Pacific Electric Railway and Los Angeles Railway (LARy). It saw heavy use during World War II, but later saw declining patronage due to the growing popularity of air travel and automobiles. 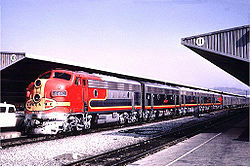 The station was placed on the National Register of Historic Places in 1980 and was designated as Los Angeles Historic–Cultural Monument No. 101 on 2 August 1972. The Ventura County, Antelope Valley and San Bernardino lines opened in 1992 in part, completely to San Bernardino by 1993, with theOrange County Line opening in 1994. Metro's Red Line subway and Metrolink's Riverside Line began operation from the station the following year. In the early 2000s Platform 1 (serving tracks 1 & 2) was converted for use by electric light rail trains and Metro's Gold Line began operating from the platform on 26 July 2003. In February 2011, the Metro Board approved the purchase of Union Station from Prologis and Catellus Development (a descendant of the Santa Fe and Southern Pacific railroads) for $75 million. The deal was closed on 14 April 2011. Since taking over ownership of the station, Metro has focused on increasing services for passengers at the station. One of the most noticeable changes is the addition of several retail and dining businesses to the concourse. Amtrak opened a Metropolitan Lounge at Union Station on 23 September 2013. The lounge is open to Amtrak passengers traveling in sleeping car accommodations, business class on thePacific Surfliner and some Amtrak Guest Rewards members (Select Plus and Select Executive levels only). The lounge features staffed ticket counter, complimentary refreshments, Wi-Fi, and a conference room. Passengers using the Metropolitan Lounge also receive priority boarding.